Wayne McLoughlin was born in Wales. His interest in nature began as a young explorer of Hampstead Heath, London, and later, of the swamps of northern Florida where he collected water moccasins, turtles and lizards for local schools. His interest in art began simultaneously, and he often recorded his hunting and fishing experiences in sketches and paintings. After serving in the USMC, Wayne pursued a dual major in Fine Art and anthropology at San Diego State University. Subsequently, he was hired by CRM Books to photograph tribal life in the South Pacific and interior New Guinea for the book, Anthropology Today. Returning to the United States after working overseas in television and commercial design, Wayne embarked on a career creating illustrated humor parodies for national magazines, including Esquire, Omni, Next, Yankee, and National Lampoon. Major corporations like Citibank, Ford Motor Company, IBM, Motorola, Adidas, Texaco, and Mastercard also commissioned award-winning pieces for their special projects and campaigns. 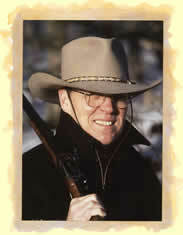 His work for scientific publishers and institutions include the National Geographic Society, Audubon, Scientific American, Woods Hole Oceanographic Institute, and the Nature Museum at Grafton, VT. Wayne’s paintings have also been utilized in many books and publications that focus on animals and aspects of nature. Wayne is an experienced outdoorsman, whose knowledgeable base of information and experience informs both his writing and painting. He has hunted, fished, and explored much of the United States, Canada, and the South Pacific accompanied by his wife, Jackie. For twenty years he has served as a regular contributor to outdoor magazines like Sports Afield and, more recently, to Sporting Tales. He was a Contributing Editor to Field & Stream for over a decade, where he explored the humorous side of the sportsman’s life in prose and pictures. Throughout his creative life, Wayne has continued to produce fine paintings, selections of which are now available as Giclée prints through this web site. For current news of Wayne’s work, please click "From the Studio."